She was described as the most dangerous woman in Europe by Adolf Hitler; Noel Coward said people who spent any time with her were always reduced to gibbering worshippers; she adored Margaret Thatcher and disliked Germans; she found the French comical and hankered for the old days of Empire and Commonwealth. 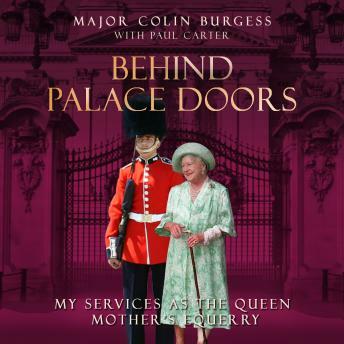 Above all, though, she was loved by the nation and in this affectionate and often hilarious inside story of Her Majesty Queen Elizabeth the Queen Mother, her former equerry Major Colin Burgess reveals what life was like living with the most private of all the Royals. Behind Palace Doors is a unique and warmly remembered historic insight into one of our longestsurviving institutions. Constantly fascinating and packed with previously untold stories, this is also a celebration of a life gone and a way of life fast disappearing.